MINOR premiers Hekari United have cemented the top spot in the Telikom National Soccer League (NSL) with a 3-1 victory over Tukoko University in the washout match at the Lloyd Robson oval yesterday afternoon. Hekari United skipper David Muta put his side ahead in the first half while Kema Jack collected a double on the other side of the break and it was enough to see them through to the finals starting next weekend. 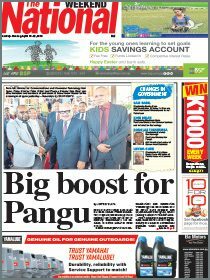 Without their big signings from Solomon Islands except for Benjamin Mela and Fiji duo of Tuimaci Manuca in the forwards and Pita Bolatoga in backline, supporting the local boys, they did well to hold off University. Muta (David) was well supported by Erickson Komeng to ensure Hekari found the net in the first half. In the second half, striker Moffat Deremoa, who supported teammate Clifford Wate beat Hekari fullback Charles Paranda before dribbling past Bolatoga, to level the score 1-1. The equaliser lifted Unitech-based team that saw them bombarding their opponents’ defence with some good football but they were unable to find the target. However, Hekari’s moment came when tireless fullback Koriak Upaiga dribbled towards the Boroko market end of the field before sending a cross towards that found Jack for a header to extend the lead 2-1. Hekari United were denied a goal minutes later after Jack was found offside but made up for it later by pouncing on Manuca’s volley for his second and winning goal. The visitors had several opportunities through Clifford Wate, Freddie Pettello, Darius Edwin which went begging. The unofficial points ladder as of yesterday: Hekari United 36, CMSS Tigers 26, Gigira Laitepo Morobe FC 24, Esiloan University 23, Eastern Star 21, Tukoko University 20, Gelle Hills 15, Niupetro Fox 10 and Besta PNG 7. Matches will continue over the long weekend with Lae and Port Moresby hosting double headers to wind down the Telikom NSL 2009-10 season. 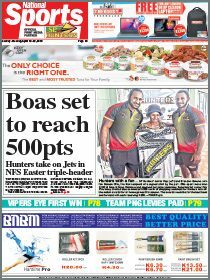 In Port Moresby, Eastern Star will have to beat Besta PNG United with five goals at least to consolidate their spot in the finals. However, they will also be banking on the results of Gigira Laitepo Morobe and Esiloan University match. The other match is between Hekari United and Niupetro Fox.